Scarlet fever is caused by the same bacteria that causes strep throat, and it most often presents in children between five and fifteen years old although it is possible for adults to contract it. A simple physical exam and possibly a throat swab can diagnose scarlet fever. It’s very important to seek medical attention for this illness. Antibiotic treatment is necessary to prevent complications, including a spread of the bacteria to other areas of the body or a development of rheumatic fever, a serious inflammatory disease. Learning more about scarlet fever can help you recognize symptoms before they get severe. To prevent the spread of this bacterial infection, don’t come into close physical contact with anyone who has it. Wash your hands often, and be sure to wash personal items used as soon as possible, including utensils and glasses. Below is more information about scarlet fever. Scarlet fever presents with common flu-like symptoms, including a fever, sore throat, headache, nausea, vomiting, and swollen lymph nodes in the neck. You may also have a hard time swallowing. The name “scarlet fever” comes from additional symptoms, including a red rash and red lines that present around the folds of your skin. Your face and tongue may also take on a reddish color. What does the scarlet fever rash look like? The scarlet fever rash is different from other types of rashes. First of all, it may be mistaken for a sunburn. It turns the skin a reddish color, and you’ll see a pale spot if you press on it. However, this rash feels rough, as if you’re rubbing sandpaper. It typically starts on your face and neck. Then, it spreads to other parts of your body. Scarlet fever is treated with antibiotics as well as standard treatment for a cold or flu. Over-the-counter pain relievers can ease symptoms, as well as throat lozenges, warm or cold foods, bed rest, plenty of liquids, and a cool mist humidifier. If you suspect you or your child may have scarlet fever, visit your local FastMed Urgent Care clinic today. It’s our goal to get you in and out in an hour, and you can use ZipPass to help cut down your wait time even more. Don’t waste hours in the emergency room or wait days for an appointment to see your regular health care provider. 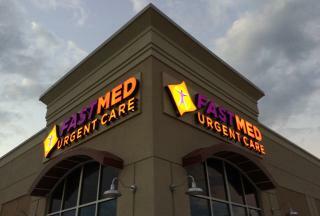 Trust FastMed to provide the diagnosis and treatment options you need to get well.